The STIFFIE WhiplineTM Alpha Numeric Identification Kit is our premiere and best-selling Alpha Numeric Identification Kit. This is "the" registration decal that has set the standard for the 20+ years that it has been available on the market. This two-color registration decal features a flowing brush stroke look with a rounded cursive font type. The characters all slant forward and the exterior color fades in from the bottom over the interior color. The exterior outline color is heavy which allows for character over lapping, enabling you to create a unified, custom look like never before. 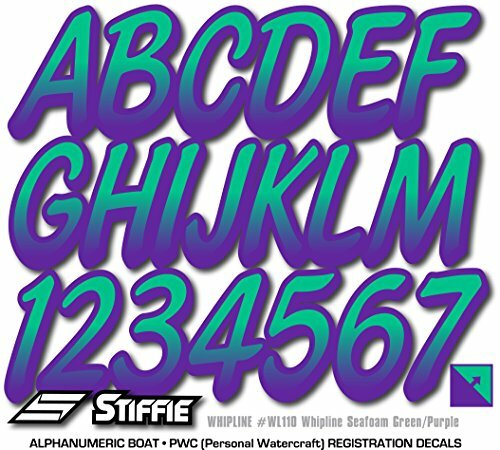 STIFFIE decals are made to match your OEM Boat, Marine Vessel or Personal Watercraft using our COLOR CLONETM print system.